Levels of Endocrine Hormones -particularly androgens. During the time that hormonal changes caused by menopause take place, the levels of androgens rise and many women find that their hair has thinned. 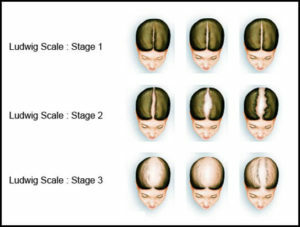 Female Pattern Hair Loss (FPHL) is a form of androgenetic alopecia with a multi-factorial, genetically determined trait. Both androgen-dependent and androgen-independent mechanisms plus a biologically normal aging process is involved. Female and male members of the family may both be affected. Majority has normal type II 5-α reductase levels and normal DHT level in scalp skin. Elevated androgen level were seen in 16% of women with hair loss alone, and 79% if associated with hirsutism or menstrual disturbance. Telogen effluvium (TE) is the most common cause of diffuse hair loss in adult females. Abrupt, rapid, generalized shedding of normal club hairs, 2-3 months after a triggering event like parturition, high fever, major surgery, etc. indicates TE, while gradual diffuse hair loss with thinning of central scalp/widening of central parting line/frontotemporal recession indicates FPHL (Female Pattern Hairloss). Excessive, alarming diffuse shedding coming from a normal looking head with plenty of hairs and without an obvious cause is the hallmark of CTE. Complete blood count and routine urine examination, levels of serum ferritin and T3, T4, and TSH should be checked in all cases of diffuse hair loss without a discernable cause, as iron deficiency and thyroid hormone disorders are the two common conditions often associated with diffuse hair loss. The prognosis of Chronic Telogen Effluvium (CTE) is less certain and may take 3-10 years for spontaneous resolution.